Silicon Valley has dominated the U.S. startup ecosystem for many decades. Despite repeated efforts, only a few cities outside the Valley (New York and Boston) have historically had the critical mix of VC funding, network, and talent to fuel vibrant startup centers. Best startup city rankings have reflected this truth for a long time. But this is becoming less true today, as more and more entrepreneurs find their way across the U.S. There are now many metro areas with growing infrastructure and increasingly skilled workforces that can support tech startups. Increasingly, these metro areas are regularly appearing in rankings of the best cities in the United States for startups and entrepreneurs. The good news is that these new metro centers are significantly less expensive than Silicon Valley or the East Coast. Let’s take a look at some of the best U.S. cities (outside of Silicon Valley and the East Coast), to build your startup in 2019. 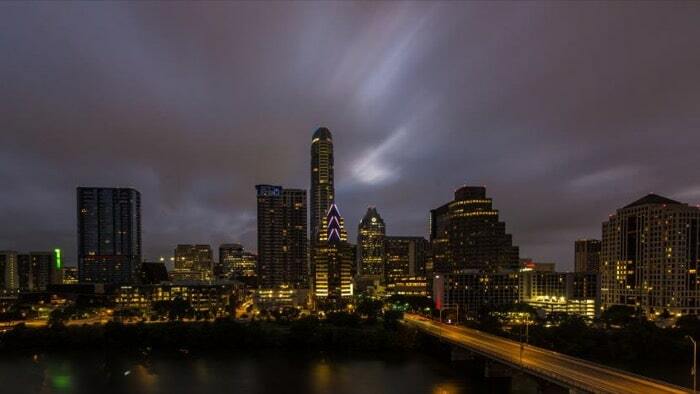 The Texas capital recently was named the #1 place in America to start a business by CNBC. 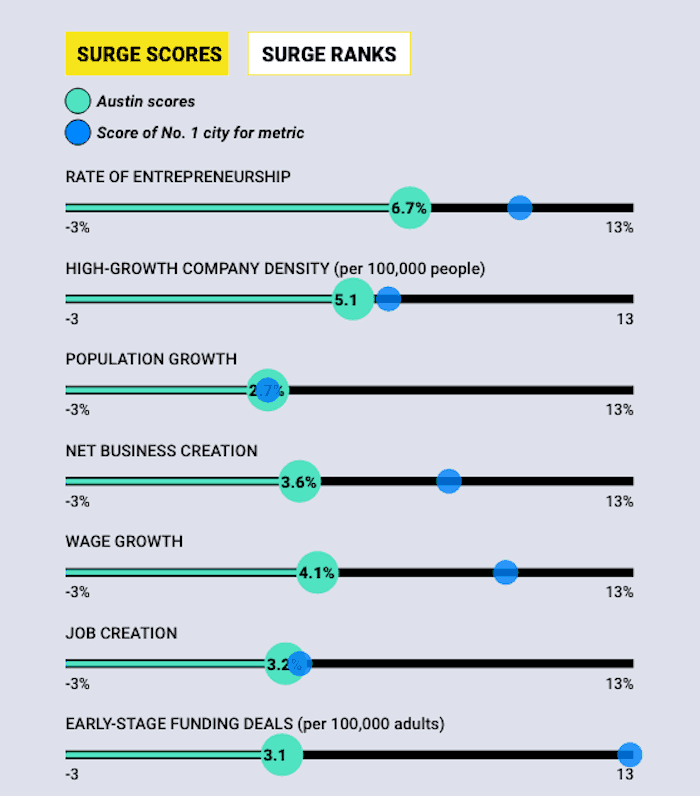 According to the 2016 Kauffman Growth Entrepreneurship Index, Austin grew its startups faster than every city except Washington, D.C., with their startups growing by 81.2 percent. 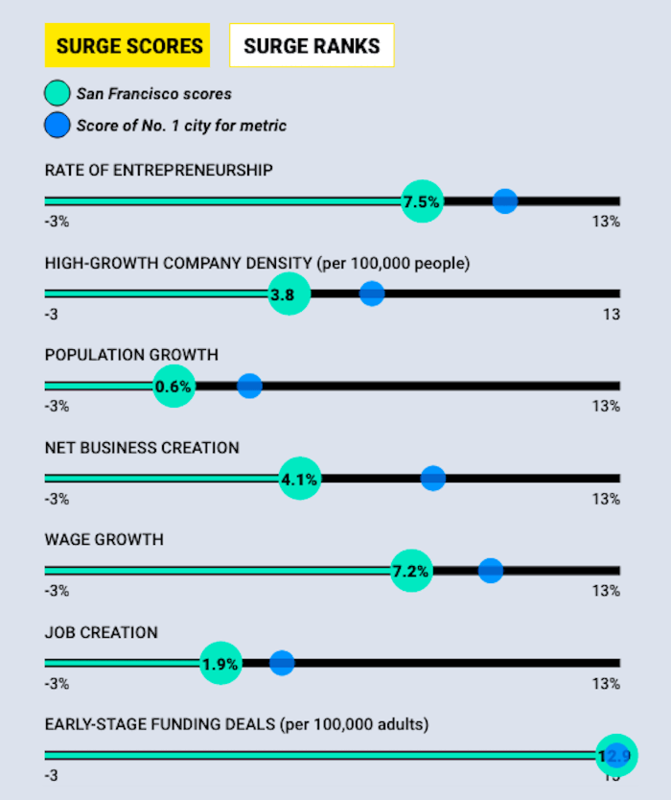 That’s exceptional startup growth that other cities will find tough to match. In large part due to the University of Texas at Austin and other universities’ influence, Austin is known for having an educated workforce. Austin has become quite a hotspot. Employers and people interested in growth industries are drawn to the youthful, smart energy that flourishes there. It’s got the music, the university scene, the hippies and the rule-breakers…. It’s very easy to hire people who want to push the limits. It’s an incredibly innovative city. Austin also stands out for its affordability. Many small-business owners, who often pay taxes at the individual level, appreciate the fact the state has no personal income tax. The state also has a corporate tax rate of zero. Combined, these factors point to available money for business owners to invest in their ventures. 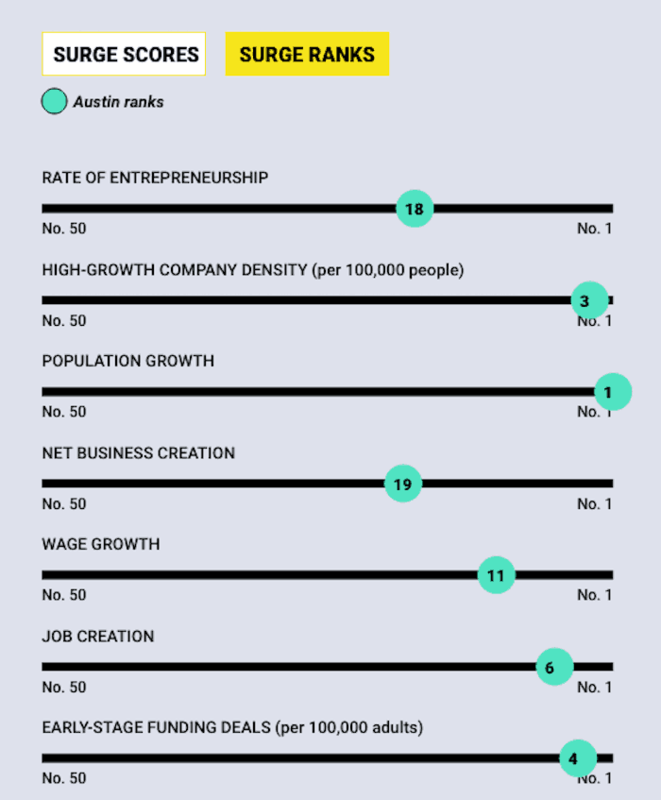 The overall culture in Austin is renowned for its supportiveness of the small business community. The celebration for its unique culture and flourishing business community is very appealing, and many new startups are flocking to the city to embrace it as their own. Boulder may be known for its eccentric, diverse population, but that reputation belies its true nature as an entrepreneurial powerhouse. In 2015 Nerdwallet.com chose it as one of the best places to start a business, as well as the #1 city for female entrepreneurs, and for good reason: It’s an affluent urban center and was ranked as one of the top 20 most productive metro areas in terms of GDP. 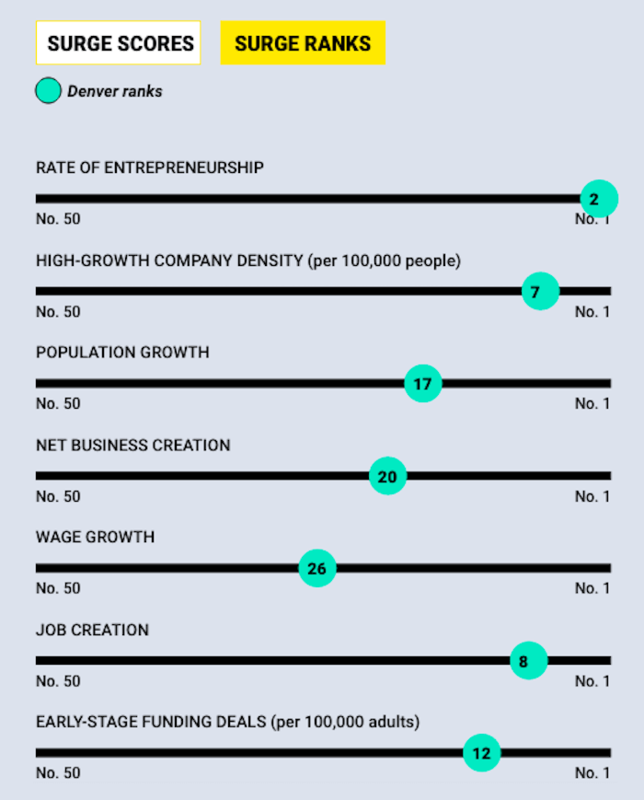 It’s no wonder so many entrepreneurs launch their startup in Boulder. A number of high profile companies call Boulder home, including herbal tea leader Celestial Seasoning, Ball Aerospace, and respected startup accelerator TechStars. Boulder’s entrepreneurial system is bolstered by a number of local venture capital firms, including Foundry Group. Entrepreneurs here use a ‘give before you get’ mentality. We are willing to help anyone without an expectation of what we are going to get back in the short term. This creates a powerful long-term dynamic. Boulder is an entrepreneurial force of nature. In 2010, the city had six times more high-tech startups per capita than the nation’s average. 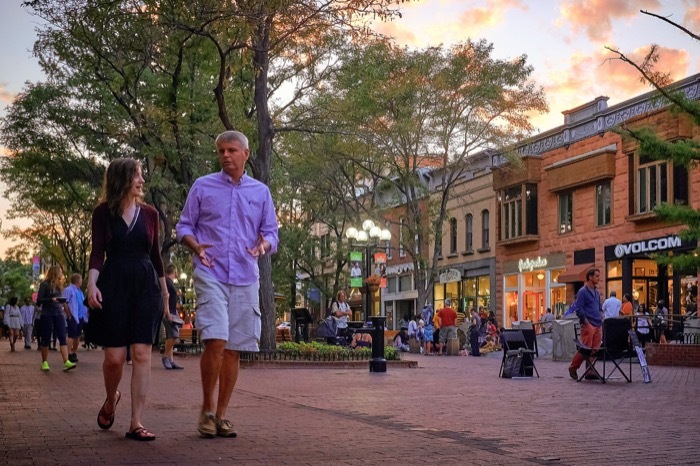 Its dynamic culture encourages Boulder’s prosperous economy, draws people in (especially millennials), and provides them with excellent motivation to stay. Don’t let the sand, sun, and tourism of the South Beach distract you from Miami’s reputation as a great place for new businesses. 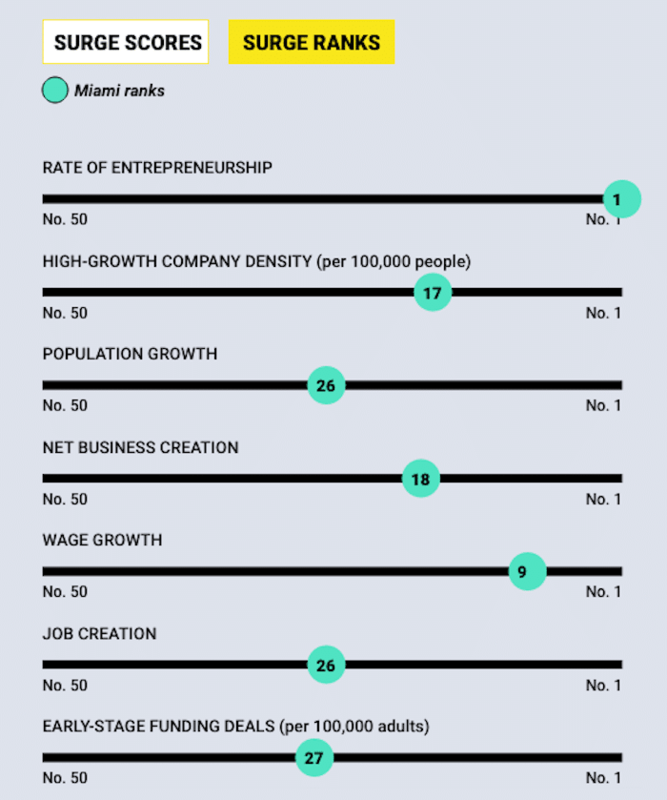 The Kauffman Index recently named Miami the second most entrepreneurial city in the U.S., with the country’s highest startup density, 247.6 startups per 100,000 people. The city isn’t just the home of new businesses. Large companies like Google, Twitter, Facebook, and Apple have offices there, as well as 139 companies on the Inc. 5000 list of fastest-growing private companies. There is talent, there is support from the institutions and private initiatives that are focused on boosting innovation, and there is an incremental interest from VCs and business angels for innovative projects. We were searching things like AngelList, GitHub, different state web sites, then we took all that data and Miami was at the very top of the list in every important category…Cheapest for our employees, and the best tax situation for the company and our workers. A diverse, skilled population, robust entrepreneurial environment, and an invaluable bridge to Latin America: The “Magic City” may be just that for entrepreneurs seeking a thriving, business-friendly place to set up shop. 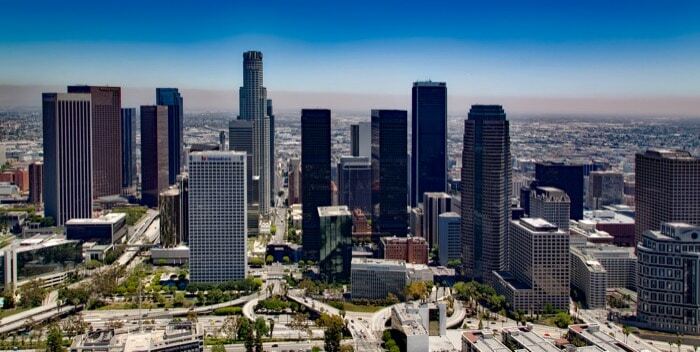 Los Angeles is known for sun, stars, and surf, and now you can add startups to the list. The city is renowned as a center for tech entrepreneurship. In addition to being the third largest startup hub in the U.S. (behind Silicon Valley and New York), the city of flowers and sunshine boasts one of the largest concentrations of engineering graduates in the country. 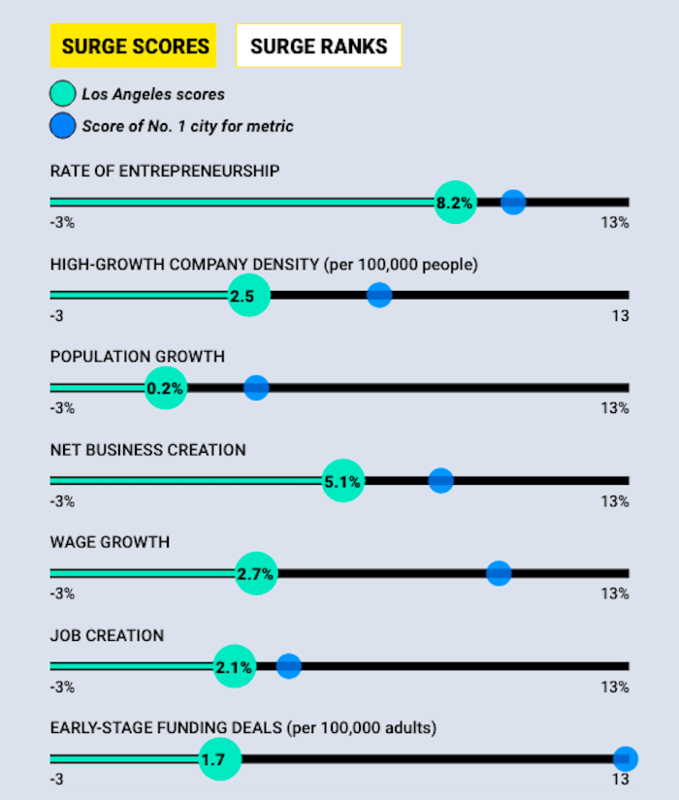 LA has also increasingly attracted more and more venture capital investment and investors. All of these things aside, one of its biggest attractions may be what is not: Silicon Valley. Compared to San Francisco in particular, it’s very cheap. Santa Monica is one of the most desirable neighborhoods in L.A. and I have a yard with a pool and a beautiful home for less than what I would pay for an equivalent-sized condo in San Francisco. The city isn’t lacking for high-profile companies, either, with Snapchat, SpaceX, VR trailblazer Oculus, and League of Legends creator Riot Games calling Los Angeles home. Whether they’re here because of the diversity, the mild weather, and the relaxed atmosphere, the city’s energy fuels and sustains a community of entrepreneurs. I’m seeing a consistent pattern of optimism, curiosity, and community, That kind of energy and like-mindedness is a breath of fresh air and super motivating. Venice itself represents this sort of oddball collection of people representing different backgrounds and worldviews, but they share an openness and a curiosity that, when you harness it for a common cause like building a startup, is very powerful. The days of San Francisco being famous for trolley cars, Rice-A-Roni, and serving as a refuge for artists and bohemians are long over. For better or worse, the city and the Bay Area are now synonymous with entrepreneurship and innovative high-tech thought leadership. 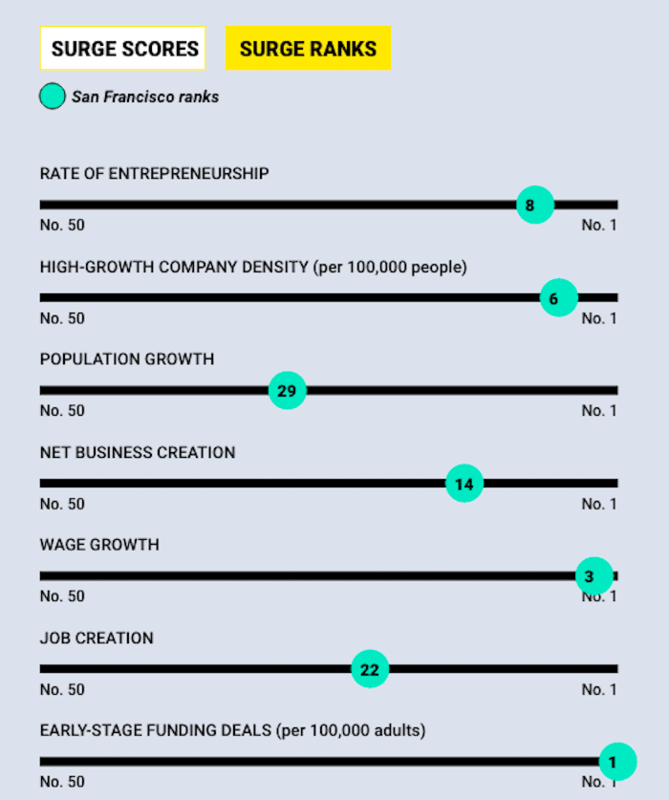 The concentration of startups, especially tech startups in the city by the bay is dizzying. You can find Twitter next to Square and Uber, and Dropbox, Pinterest, and Zynga within blocks of each other. The whole city feels like a self-perpetuating machine, where venture capital draws in startups, which pulls in more venture capital, and so on. If the tourist tours of start-ups are any indication, the area’s nickname as the “Hollywood of Technology” is wholly appropriate. It makes a lot of sense for companies and entrepreneurs to want to be here. In addition to the availability of funding and startup resources, the huge numbers of skilled workers and prestigious schools that help to educate them are unparalleled. 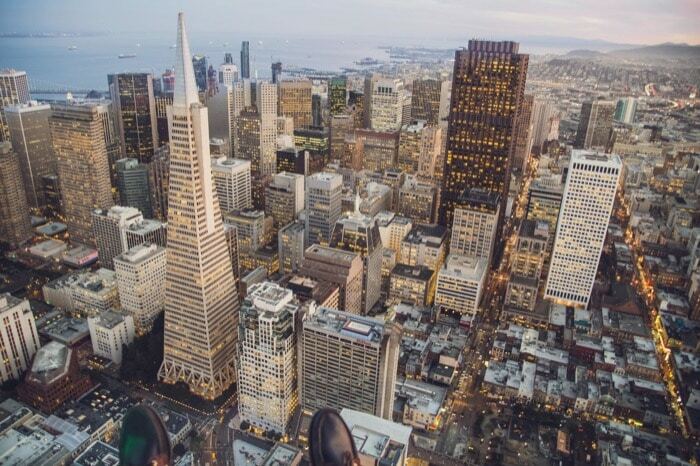 Musician Paul Kantner once said that San Francisco was “49 square miles surrounded by reality.” That may be true when it comes to the opportunities for startups and entrepreneurs, but the reality of big money and big business’ strain on the city itself is everywhere. Housing and rent prices are at unbelievable levels, and the difficulties of such a high cost of living are real and growing, issues. All of these things said, the benefits to entrepreneurs found in the city and Silicon Valley are many, and for some, the intensity of energy and innovation found here may be irresistible. Utah’s entrepreneur-friendly culture is well known, but even with that considered there is still something noteworthy going on in the Beehive State, especially in Provo. The amount raised in 2014 by companies based out of the Provo-Orem metropolitan area was staggering: around an average of 51.3 million dollars. This, along with over 800 million dollars raised by Utah-based companies that year ranked Utah as the seventh highest in the country, an impressive achievement for a state with just three million people. There are a lot of big companies based in Provo, too, which helps attract and retain people with desirable skills and experience. Novell has its corporate headquarters in the city, as do Qualtrics, BlueHost, and Jive Communications. Brigham Young University has renowned entrepreneurship programs and produces many graduates who start businesses of their own. 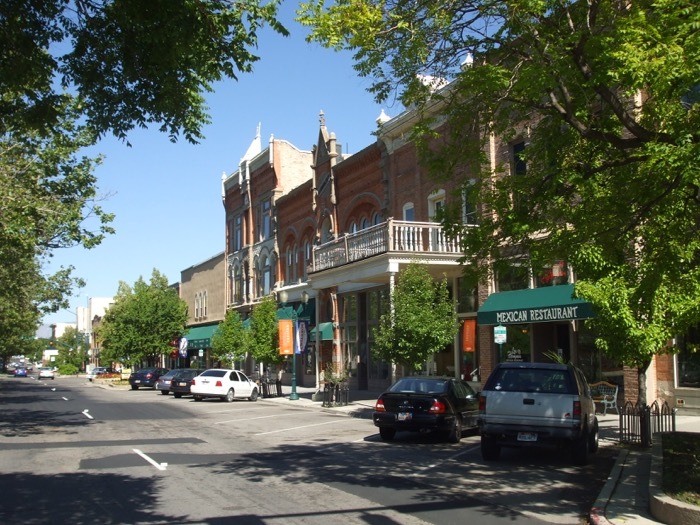 Provo also stands out as a great city for entrepreneurs and startups because it’s affordable. The cost of living in the city is a big attraction, with the median price of homes hovering around $220,000. Compared to the median price of homes in San Francisco (which as of June 2017 was over 1.5 million), the cost of living combined with the access to venture capital, and a skilled, motivated workforce makes Provo a compelling option. 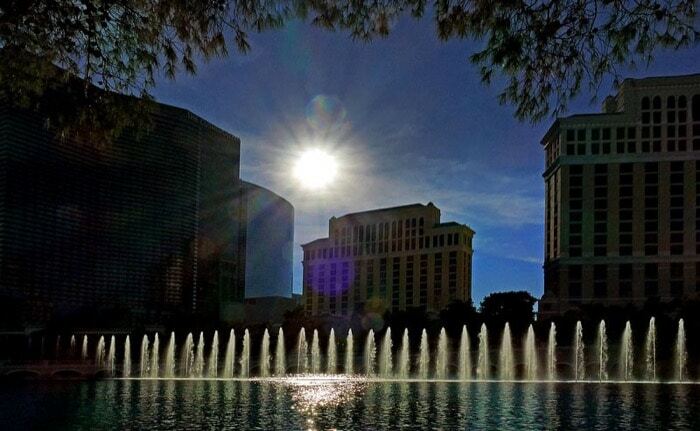 Startup activity in Las Vegas is booming. A recent study by the Kauffman Foundation found Las Vegas bounding onto the startup scene, countering the public perception that Vegas is entirely centered around gambling and resorts. After the economy crashed in 2008, Las Vegas was pushed to reinvent itself in order to survive. With businesses clearing out of California because of its oppressive taxation, Las Vegas welcomed many of those entrepreneurs with open arms and appealing tax relief. The city is now the host to many of the largest industry trade shows for tech and other industries. It also boasts plenty of investors with co-working spaces, as well as funding and mentoring programs to stimulate a business environment. Tony Hsieh of Zappos appreciates the “endless possibilities” he has discovered in Nevada. Hsieh put $350 million into revitalizing Las Vegas to contribute toward it becoming “the co-learning and co-working capital of the world.” He began a venture fund in 2012, VTF Capital, which invests in other businesses interested in joining the Nevada scene. Living in Nevada is significantly more cost-effective than most other places in the country. Las Vegas sets itself apart from startup cities like Boston and San Francisco by offering a much lower cost of living in a major city. This is extremely attractive for younger professionals interested in city living – and lets them afford to experience more than a closet-sized apartment filled with Cup-O-Noodles. Maybe there’s something about the majestic mountains in Denver, a symbolic challenge perpetually imagined in its rising peaks. 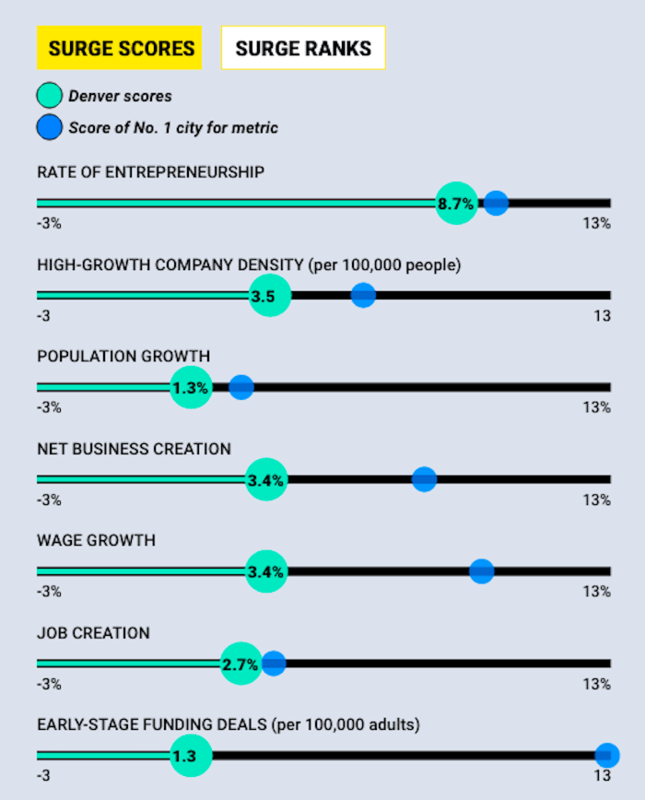 According to the Kauffman report on entrepreneurship, Denver is ranked fifth for a US city with the most start-up activity. As Denver continues to explode with startups and small business ventures, an increasing number of millennials are heading to the beautiful city. 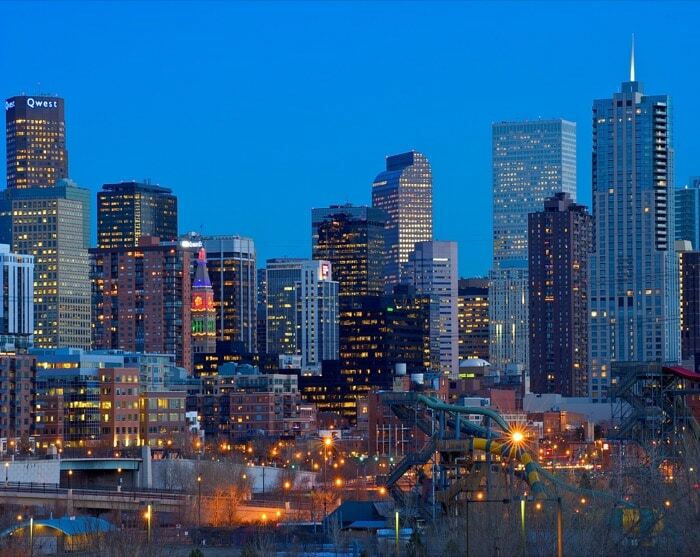 Denver is also one of the most educated cities in the US. 53 percent of the population holds a bachelor’s degree, and Colorado is ranked first as a relocation city for skilled workers ages 25 to 44. Investment in transportation is another major player in Denver’s appeal. It has a new, multi-billion dollar rail system called FastTracks, which is continuing to expand. There is of course also the Denver International Airport, which is now the largest American airport by landmass – and it’s only half completed. Gusto, the San Francisco based payroll startup, just opened its second office in Denver this month. Rachel Kim, a communications employee with the company, cites Denver’s close proximity and easy transport to the Bay Area as major reasons for Gusto branching out there. She also cites the spirited small business community is being a significant part of the city’s appeal. We have a really supportive startup environment, partially because we’re a relatively smaller community. The companies out here, they’re rooting for each other. Between the striking beauty of the landscape, the easy access to major transportation, and the vibrant and educated community, Denver would make a great choice for anyone ready to set out on their startup journey. 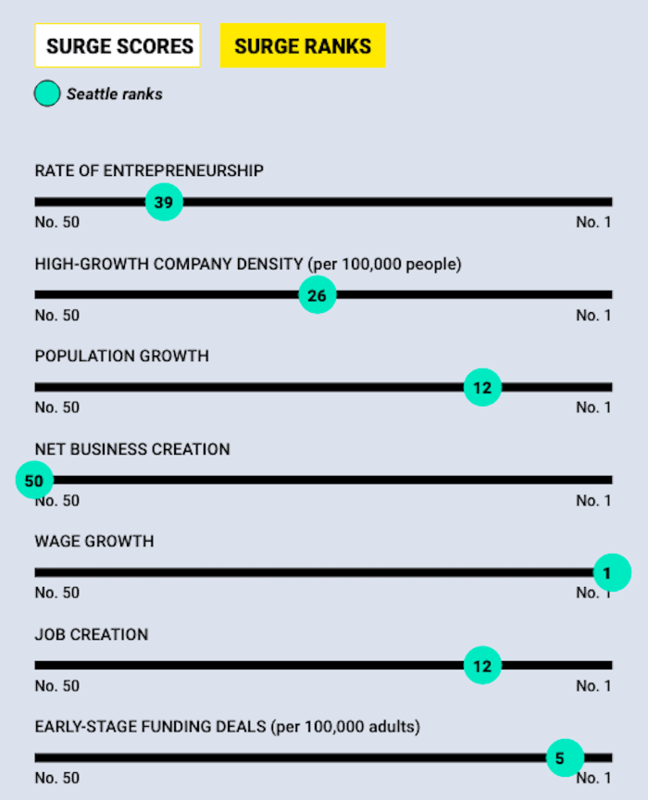 Seattle is home to Microsoft, Amazon, Starbucks, and other well-known companies, but it has recently grown into a welcoming place for startups, entrepreneurs, and small business owners, too. Seattle has been among the fastest-growing cities in the United States since 2010, and its population is expected to increase by an additional 200,000 over the next 20 years. A young, vibrant population, a booming tech industry and a run of interesting restaurants, unique shops and coffeehouses are among the reasons for the increase in start-up traffic in Seattle. 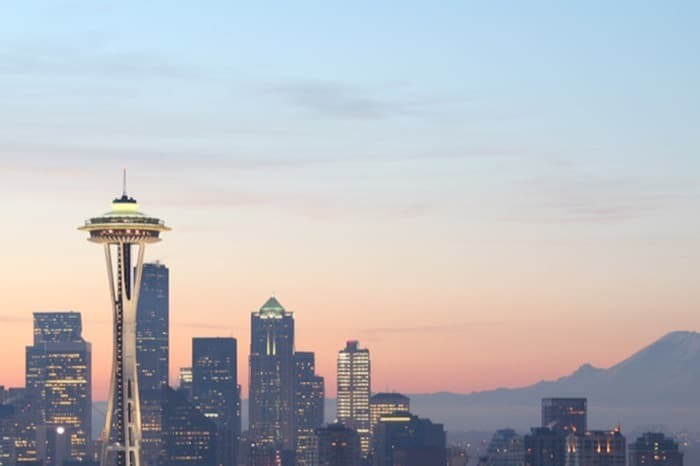 “Seattle historically is a place that attracts pioneers to come and do their own thing,” says Maud Daudon, CEO of the Seattle Metro Chamber of Commerce. Those pioneers are attracted to the eclectic, entrepreneurial spirit that the city breathes. 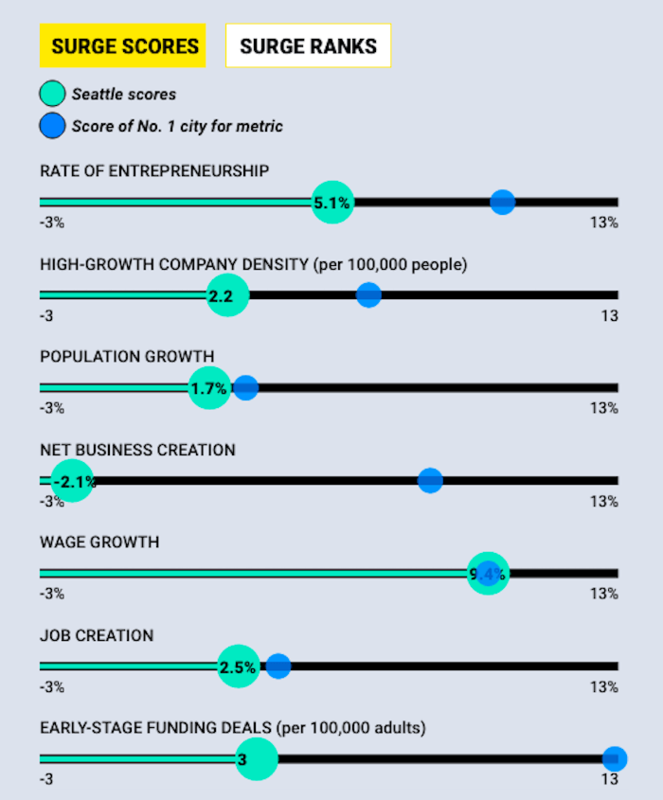 Seattle doesn’t offer major tax incentives for entrepreneurs, but it does have plenty of venture capital firms and economic development ventures to help foster the development of small businesses and start-up companies. Just as enticing as these are the incubators and business programs at the University of Washington and community colleges, where aspiring entrepreneurs can get their start. As always, we’re excited about listing Chicago on our list of top cities for startups and entrepreneurs. And this status is well deserved. 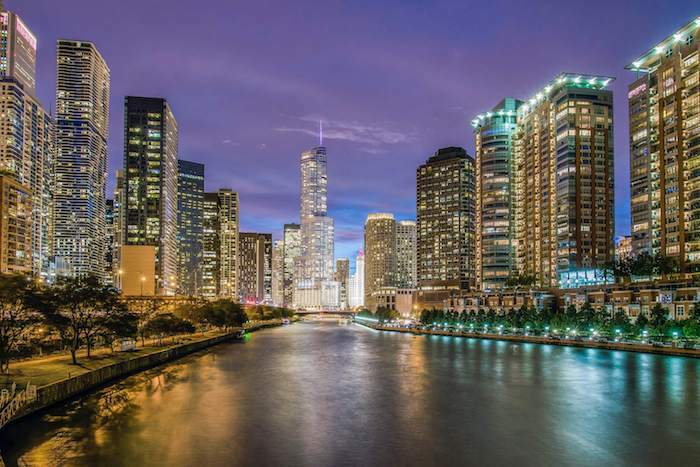 Chicago stands alone, not just in the Midwest but in the United States, among the “biggest and baddest of startup cities” when it comes to profitability, according to PitchBook. That’s only one reason venture capitalists love Chicago. 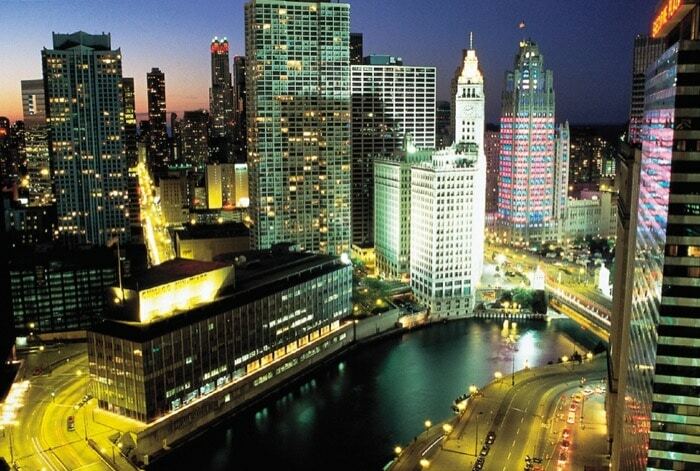 Chicago’s tech proficiency is becoming increasingly more recognized in the start-up scene. KPMG’s survey of more than 800 tech leaders found Chicago in the top 10 of tech innovation hubs worldwide. KPMG Chicago’s Mike Gervasio further cited the capital market and “an innovative culture” as partially responsible in Chicago’s impressive climb up the global ladder. That culture helped garner upwards of $1.7 billion in funding last year, and Chicago is host to a multitude of promising start-ups. Startups in Chicago make good bets for those who invest in them. In Chicago, 45 percent of investments produced 10 times a return on investment. 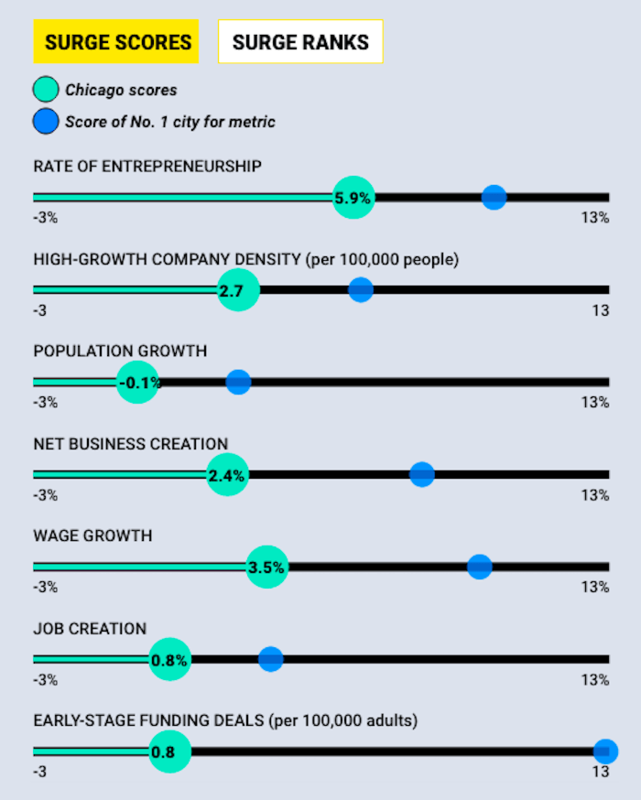 Chicago’s numbers are routinely superior, with 81 percent of its startups producing between three and 10 percent a yield on an initial investment. Now wonder VC’s love Chicago. 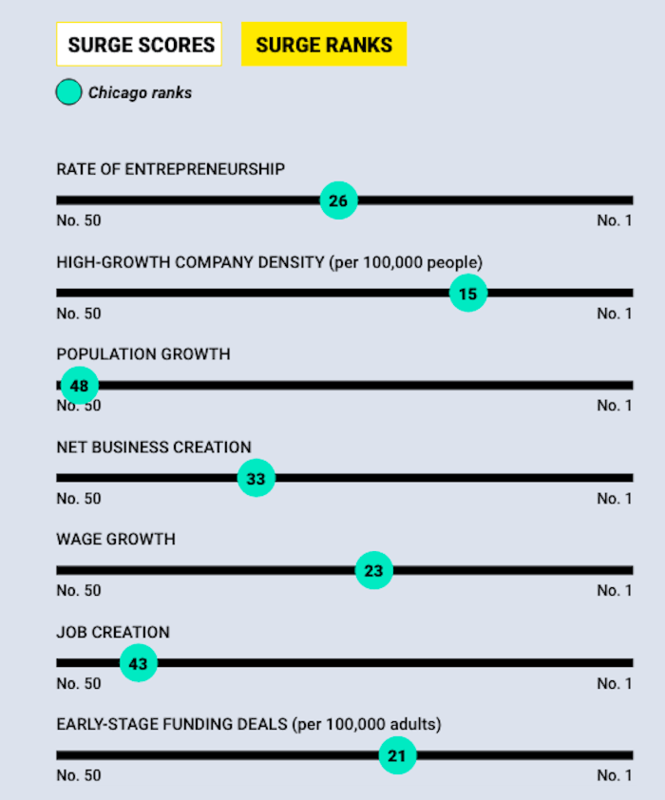 While startup resources in Chicago were scarce a decade ago, things have changed quite a bit. Chicago’s 1871, created in 2012 to support Chicago’s startup community, ranks 1st in the U.S. among North American Business Incubators and 4th in the world. 1871 is home to hundreds of early stage, high growth digital startups and offers tremendous resources and programming to entrepreneurs at all stages of their startup journey. Sound good? We think so. Crowdspring couldn’t imagine home being anywhere else. Here are some additional U.S. cities that you should keep in mind as some of the best cities for startups and entrepreneurs. These cities are rapidly becoming successful hubs of entrepreneurial activity. Are you ready to launch your startup or take your existing one to the next level? Enlist crowdspring’s help! Our team of over 210,000 creatives is ready and waiting to handle your business’s package graphics, logo design, web design, and more – everything you need to build a great brand identity. And, our outstanding customer service team is available to guide you through the whole process. Get started now and request a free, no obligation design consultation with one of our design experts today.